With many teams getting ready for NACSW NW3/L3 or AKC Master/Detective levels, having a solid search strategy and a strong mental game plan is key! At these higher levels, you will have unknown number of hides – very different from knowing how many in each search area. You can even have a blank interior (no hides) in NACSW NW3/L3 and AKC Masters. Blank rooms are not that common, but you are always on the lookout! Really not as scary as you think … knowing how long your dog usually takes to find a hide will help determine when your dog can’t find anything! They will also work HARDER to find SOMETHING – heavier sniffing, looking high, giving the appearance of sourcing odor. Don’t be fooled and wait for a clear indication if there is a hide or call it Finished with no hides. When training and preparing for searches with unknown # of hides, it’s SO ok to not find them all! Push your inkling a bit – call as soon as you think you’ve covered the area and found all the hides. Worst that will happen is your helper will say there are more and you’ll keep searching. When you get it right, you’ll start to develop that confidence in knowing and reading the situation. Focusing on NW3 a bit, the hides are not necessarily that hard – usually no harder than what you have had in NW2. You also won’t see many searches with the max 3 hides, and rarely do I see/hear of one with 2 areas of 3! I don’t recall having any/many inaccessibles or super elevated hides in my NW3 searches. Distractors in containers are also not required as they are in NW2 but you still want to be prepared for distractors and for anything! Key point here is to not fret over difficulty of hide placements – you have the skills, now you trust your skills and listen to your dog! Sounds doable, right? It is! Same with all competition – the more you practice and trial, the more comfortable you’ll be in reading your dog and making your calls. tup. When initially the thought of unknown # of hides is incredibly nerve wracking, it becomes a RUSH to team up with your dog and go do your thing – all that training you have built on skills and gaining fluency for the search and indication. Learn how long it takes for your dog to find 1, 2 and 3 hides in a few scenarios. Lots of dogs I time in classes or see online find 2 hides in one minute. And find 1 within 30s. Knowing how fast your dog on average will find hides, will help you make that finish call. Cover the threshold area! Go back and check the front of the search area again before calling finish. Get in and get out. Cover area around 2 times – both direction and middle. If you stay too long, you WILL talk your dog into a hide. Don’t think there must be 3 or can’t only be 1. There are just as many as there are! Don’t assume number of hides or where hides may be placed or base anything off the amount of time given for a search! They’ll put 1 hide in a 3 minute search or more hides with less search time. Count aloud as you find each hide. Know where you found each hide – if you double count, the judge will still say yes and you’ll think you found a new one and may think that is the max and call finish too early. You can even say “1 on post”, or “2 in purple box”. Saying it aloud will help you remember!! Once your dog can’t find any (Interiors) or any more, they often search with more intensity and sniff louder. That can look like being in odor, but it’s really them trying to FIND odor. Know your dog. Does your dog really get more intense/sniff louder, up their pace when honing into odor? 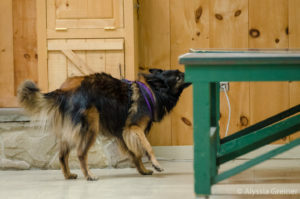 Most dogs don’t and usually start to calm down, slow their pace and focus on honing in on the hide location. You can also decide to search up to the 30s warning then call finish if your dog is not looking to be close to indicating anything. You may even find you don’t have to wait that long and just “know”. But it’s a valid strategy initially, as long as you don’t let your dog talk you into a hide! I’ve also found that some COs will make shorter time limits (2:30 versers 3:00 min) to actually HELP you not search too long! Be warned that, although rare, a timer may forget to give you a warning and if they call time, you will not pass since you have not called “Finish”. You can wear a finger timer or use your smart watch/phone to track your time and alert you before the time is up. This is legal – and you should practice starting your timer as part of your start line routine. On your mental game, here are a few thoughts and ideas to stay focused, positive and how to handle your nerves! Excitement gives us that edge. If we didn’t feel excited we wouldn’t want to be there. Feeling butterflies in your stomach? You just need to get them to all fly in the same formation! If your goals are not achieved you will learn valuable information. You will have other opportunities to demonstrate your skills. Thanks for this post. I found it very helpful. It’s easy to over-think the NW3. This post feels like a great antidote to that. Thanks Julie…I love that you post these pieces of NW wisdom for all of us! Incredibly useful!